Tom Rosenbauer has been with the Orvis Company for 34 years, and while there has been a fishing school instructor, copywriter, public relations director, merchandise manager, and was editor of The Orvis News for 10 years. He is currently Marketing Director for Orvis Rod and Tackle. As merchandise manager, web merchandiser, and catalog director, the titles under his direction have won numerous Gold Medals in the Multichannel Merchant Awards. 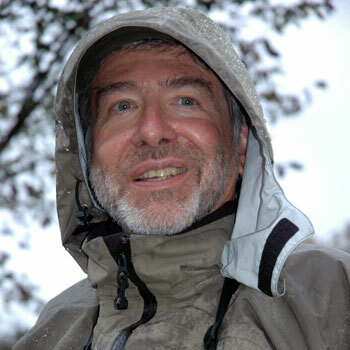 Tom Rosenbauer has mastered the strategies and techniques necessary to be productive on small streams. Listen in to learn his secrets. Tom was awarded Fly Rod & Reel’s "Angler of the Year Award" for 2011 for his educational efforts through his books, magazine articles, and podcasts. Tom has been a fly fisher for over 40 years, and was a commercial fly tier by age 14. He has fished extensively across North America and has also fished on Christmas Island, the Bahamas, Belize, in Kamchatka, Chile, and on the fabled English chalk streams . He is credited with bringing Bead-Head flies to North America, and is the inventor of the Big Eye hook, Magnetic Net Retriever, and tungsten beads for fly tying. He has ten fly fishing books in print, including The Orvis Fly-Fishing Guide, Reading Trout Streams, Prospecting for Trout, Casting Illusions, Fly-Fishing in America, Approach and Presentation, Trout Foods and Their Imitations; Nymphing Techniques; Leaders, Knots, and Tippets, The Orvis Guide to Dry-Fly Techniques, The Orvis Fly Fishing Encyclopedia, and The Orvis Fly-Tying Guide, which won a 2001 National Outdoor Book Award . He has also been published in Field & Stream, Outdoor Life, Catalog Age, Fly Fisherman, Gay’s Sporting Journal, Sporting Classics, Fly Rod & Reel, Audubon, and others. His latest book, The Orvis Guide to Small Stream Fishing, was published in March of 2011 is a spectacular book published by the prestigious Rizzoli International, world renowned for their design and reproduction. Tom is the writer and narrator of “The Orvis Fly-Fishing Guide Podcast,” one of the top outdoor podcasts on ITunes. He lives with his wife and son in southern Vermont on the banks of his favorite trout stream.